I have an issue, actually I have a few (some may say I have many) and I’m looking for some guidance, so please dear blog friends, give me direction. Warning: I may not adhere to any of your advice, which for these purposes we shall blame my undying stubbornness, but I promise to value it nonetheless. Problem No. 1: I don’t know what to do tomorrow. Initially the plan was to participate in my first ever triclinic (slash the swimming, replace it with aqua jogging) however, upon receiving the great news earlier this week from Saint Physio telling me that I could go out for a 10k and 12k run this week, I’m now thinking maybe I should run. The only day I can fit the 10k in is tomorrow as Saint Physio did not want me to do back-to-back runs. But truthfully, as excited as I am, and as much as I’m leaning towards doing the run, I’m also a little nervous, and I’ve got it in my head that 30 minutes aqua jogging, 40 minutes cycling, and 30 minutes running will be a lot easier (right) than 1 hour running. But then if I don’t run that’s one more run that I’m missing out on and these days, with just one month until the half and six weeks until the full, I can’t exactly spare any more mileage. So dear friends, what oh what shall I do? Problem No. 2: I think I was meant to have curly hair. Not Shirley Temple super tight curls, but nice, natural, wavy curls, like Kate Hudson and Katie Holmes curls. But here’s the problem, I was born with poker straight hair, nasty straight hair, you don’t need a straightener straight hair. But after chatting with my girls last night about our desires for luscious curly hair, I decided this morning I would have curly hair. And oh man did she turn out beautiful, not perfect by any means, messy for the most part, but my goodness a much softer look than that super stern looking straight hair of mine. But now what? Do I curl my hair every morning? That’s a lot of work. Do I find an ’80s salon that will pump my locks full of chemicals by way of a perm? Do I get a wig? Or, do I follow Mario’s suggestion of sticking my finger in a light socket? What do I do? Problem No. 3: And then there were three. For three days I was in the possession of $21,000 worth of insulin pumps. The broken pump; the wrong pump; the fancy schmancy new pump. The new pump finally arrived on Monday afternoon, but I didn’t get around to changing everything over to the new pump until this morning. (The broken pump continued to work and actually got better as it dried out I think.) But, the thing is, I can’t for the life of me figure out how to sync my insulin pump with my glucometre, which after a day of having to input my dosages directly on my pump instead of through my glucometre, I’m fast getting sick and tired of it. Not A Problem No. 1: Another reason why it took me so long to transfer over to my new pump was that I feared scratching and gouging the new one like I had the old. So this morning I sent an email to my contact at Animas asking if I could order a screen protector. Within 10 minutes, she had responded telling me she was sending one out for tomorrow courtesy of Animas. She’s so my favourite! Have you experienced great customer service lately? I say do the pool combo thing cuz you should strike that iron (-clad phobia) while its hot. You may be tolerating creepy men and toe jam for now but how long can you temper it? Re: hair. I think you should learn to pin it. Also, i buy a curling shampoo and conditioner and when i use it, it works to add just a bit of curl. There are ways to add curl quick without going gangbusters. I prefer curl on me, but i also get jealous of your straight hair. Bottom line is girls are never happy. Third issue: i haven’t got a clue! Customer service? Hmm… Greek islands in abby. They made me a gluten free version of what i ordered and were more careful with me than any restaurant has ever been! I almost cried. Well, you’ve completely baffled me 🙂 But if I were to TRY and offer friendly advice, I would say: run; curl; call. Run, if you’re heart’s set on it, but don’t run so hard you risk injury, just enough to soothe the savage beast within you 🙂 Curl when you’ve got the time and inclination. I just happened to see a Shirley Temple movie last night, and DANGED if some of her facial expressions didn’t remind me of you. I know you hate it when I compare you to Ingrid Bergman, but you DO share similar features with BOTH of these delightful humans. So, curl and let your inner child out. 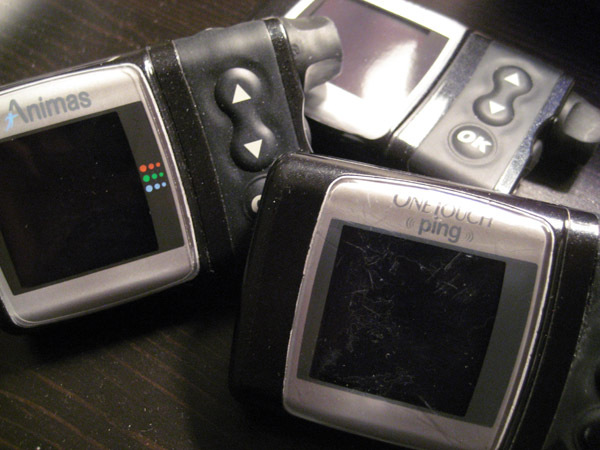 Finally, call Animus, or somebody, and ask THEM how to sync your new insulin pump with your glucometre!! Somebody MUST know how to do it. Love your hair! Messy curls are so much better than prim and proper, in my opinion. If you do decided to hang with the tri group tonight let me know and I will pop by when I get home from work. Tri group is lots of fun, no one said you have to stop at 5k….. just saying. If you decide to run then thats cool we will be here every friday. It really is a fun bunch.